SponsorTag is a well-known online advertising network operated from US since 2014. It provides contextual and display sponsored tags (ads) on publisher properties based on Cost-per-Click and Cost-per-Impressions. Apart from these opportunities sometimes SponsorTag run CPA campaigns which are highly beneficial for publishers. SponsorTag review every site before approving as a publisher. SponsorTag is not much strict and don’t have many requirement of traffic and all but yes, one must satisfy the guidelines and T&C of SponsorTag to get approved. As I said, they have certain guidelines and requirements to approve your site to show ads from SponsorTag. But if you follow these, you will get accepted by the network for sure. Below are some of the minimum requirement those have been defined by SponsorTag. • Sites must not contain any hatred, hacking, virus, adult, gambling material in any form. • Sites must not have copyrighted content. • Under construction or incomplete sites will not be accepted by SponsorTag. • You should have at least 50 visitors a day to get accepted by SponsorTag. • SponsorTag doesn’t approve sites which don’t add value to the visitors. • Sites hosted on free blog hosting platforms like blogger and forums are not allowed to join SponsorTag. • Sites meant for advertising could be rejected by SponsorTag. Sites having excessive ads must stay away from this ad network. • Publishers must not manipulate clicks/impressions. They shouldn’t ask others to click on their ads. • Traffic came through bot or fake traffic won’t be accepted by SponsorTag. These are some of the very important guidelines set by SponsorTag. You must check all these before applying for the publisher account. No doubt, SponsorTag is bit strict to approve sites but there are many pros available with the network which will give you more benefits compare to other ad network. Below are some of the benefits due to which you should join SponsorTag. • Publishers can sell their ad inventory and set their own CPM prices directly on ad marketplace. • Publishers can filter the ads according to their priorities. • Responsive ads i.e. they work on all gadgets. • The ads are geo targeted and contextual. • Publishers can optimize their ad inventory with pass back tags. These are the alternate ads used in case advertiser failed to supply ads at specified price. SponsorTag mainly offers 2 types of advertising. SponsorTag works on the common Net30 basis which means you will be paid on monthly basis. The threshold amount is just $20 which is easily achievable. The only issue that SponsorTag is having with payment is the payment option. You can get your money only through PayPal. So if you don’t have a PayPal account, just get one before going through this ad network. Like publishers, SponsorTag also offers great facilities for advertisers as well. 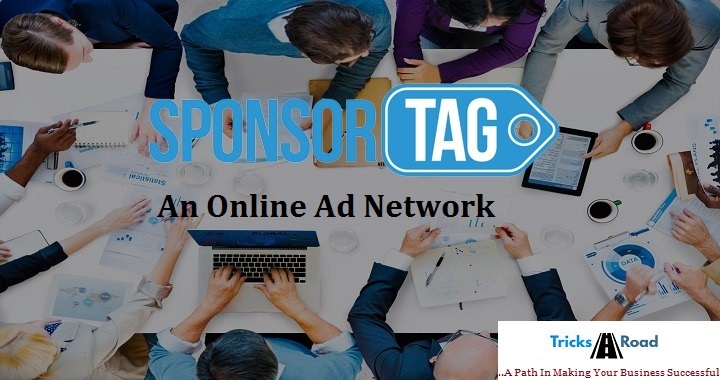 As you have seen how choosy SponsorTag network is while selecting any site to their network which directly provide benefits to the advertisers. As an advertiser, you will get assured of quality traffic and genuine lead. You can reach to your targeted customers through PPC, CPM or CPA ads. Also, you will have access to the real time analytics dashboard which will show all yours campaigns and their analytics like traffic, CPC etc. SponsorTag provides excellent service and support to their clients. No matter you are an advertiser or a publisher, you will get instant response and resolution to your queries. They have a dedicated team which are available 24x7 to help you through different modes of communication. If you have quality traffic and especially traffic from Tier I countries, you can earn well from SponsorTag. Also, one thing that should be noted here is, only those sites are getting accepted in the network which are having language as English as they target international audience. Are you going to work with SponsorTag?